This week was a Batweek. Even if the book wasn’t a Bat-title per se, Batman and his family of characters seemed to shine through. This week also heralds the return of one of the most interesting, innovative series being put out: The Unwritten. Altogether this week’s batch of comics (and make-up comic in the form of Superman/Wonder Woman #3) represent their respective titles well. Batman #27 is one of the quintessential issues of this title in understanding the New 52 version of Batman. Though he has been written by several talented writers in the rebooted continuity, Scott Snyder has been given the helm of the titular Batman title and made it the seminal series within the Batbooks group, often deferred to by the other titles in regard to canon. This issue more than proves why so much faith is put in Snyder’s custodianship of the character. So far Snyder’s “Zero Year” plot has taken Bruce Wayne from twenty-five year old journeyman to the opening cases of his career as Gotham City’s fabled vigilante. Snyder’s Batman from the present had bucked tradition a little bit, but for the most part rode the company line. This younger Bruce Wayne is much different from most versions we’ve seen thus far. 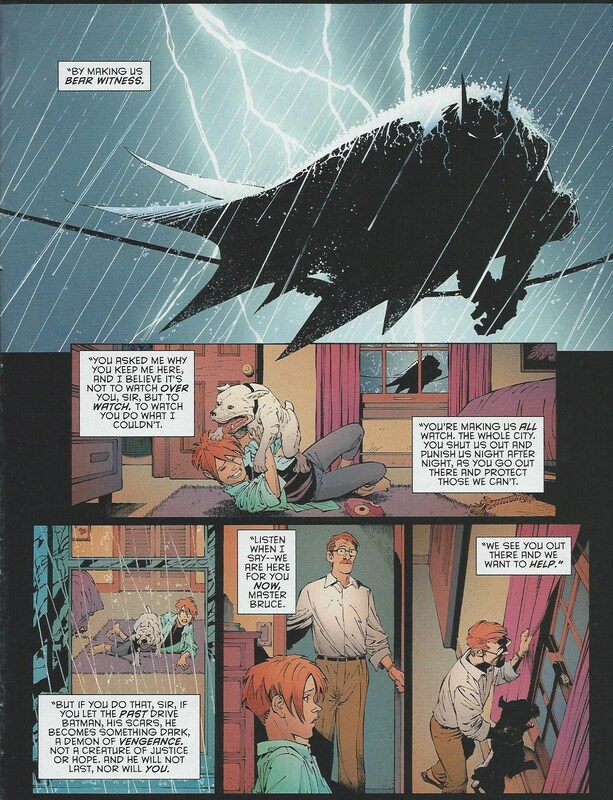 Snyder’s modern Batman as well as other versions have been terse and reserved with the character of Alfred, but “Year Zero” Batman is very cold with his manservant. What’s more, he has a downright dislike for James Gordon that transcends his nocturnal identity and is rooted in his civilian life as Bruce Wayne. In this issue Snyder gives both Gordon and Alfred their say, forcing Bruce to reevaluate each, but even more so, to reevaluate himself. Snyder interprets Bruce’s war on crime as more than a personal vendetta against criminality, but also against Gotham City itself and the citizens who populate it, and finds an apt mouthpiece for this theory in the person of Alfred Pennyworth who has known Bruce his entire life. It’s certainly a stark perspective, but one that fits the persona of Batman exceedingly well, further enriching the mystique of the character. Commissioner Gordon’s part in the story depicts a very hopeless landscape that an honest Gotham cop walks in Pre-Batman Gotham, rectifying the misconceptions Bruce had distilled over a decade and a half of resentment. Outside of the character driven plot points, this issue begins what appears to be the endgame of “Zero Year,” which began with the origin of the Joker and transitioned into Dr. Death’s killing spree with his horrific osteogenic serum. Always in the background has been Edward Nygma, aka the Riddler. Nygma had a line on the Red Hood gang, he was Bruce’s uncle’s right hand man at Wayne Enterprises, and he singlehandedly engineered the massive blackout that descended Gotham into anarchy around the advent of the tropical storm Rene. The Riddler appears to be making his move from the shadows to the forefront of the “Zero Year” plot. Encompassing some of the greatest storytelling in comics today, Scott Snyder and Greg Capullo’s Batman is a multifaceted, intelligent journey under the cowl that is destined to go down in the character’s history as one the THE enduring interpretations of the Dark Knight. Batman & Two-Face #27 is shaping up well, giving great depth to the character of Two-Face. Writer Peter Tomasi did a decent job illuminating inherent qualities of the binary badguy during Villains Month in his Two-Face one-shot, but in this arc of his Batman & Robin title he really mines the recesses of Harvey Dent’s past to show the moment when the former district attorney took the dive into madness. So far we’ve seen the return of Irish mobster Erin McKillen to Gotham and the very special relationship she has with the fallen Gotham DA. Once upon a time she put a letter opener through the heart of Harvey’s wife, Gilda, and then burned half his face off with acid. Now considering the complex and nascently sinister nature of “Handsome” Harvey, as well as the very intimate nature of their associations, I assumed Harvey in some way did something to deserve what happened to him, such as perhaps sleeping with Erin’s identical twin, Shannon, who’s death we are told Erin blames on Harvey. Nope. Shannon died in prison after Harvey put her and Erin away for being scum. He violated a few laws of ethics in doing so, but if we are going to look down on a lawyer for screwing psychopathic killers out of a few degrees of jurisprudence then reading a book about a man that dresses like a bat and brutalizes criminals without due process might not be the best choice. So did Shannon get killed on the inside by someone with a beef, thereby putting even a minute modicum of blame on Harvey? Nope. She drew straws with Erin as to who was going to commit suicide so the other could escape prison in the deceased’s bodybag. So if Erin REALLY wants to take out the person responsible for her sister’s untimely death she should put the gun to her own head before seeking out Harvey. This issue reveals more about Harvey’s past and the connection with the McKillen family and again, contrary to my expectations, Harvey comes out cleaner with every page read. He was the personal attorney for the McKillens before his conscience and a little push by Bruce Wayne got him in the DA’s office where he made things right and muzzled two mad dogs. This change of conscience coming when the sisters ordered a hit on Commission Gordon’s pre-teen CHILDREN!!! 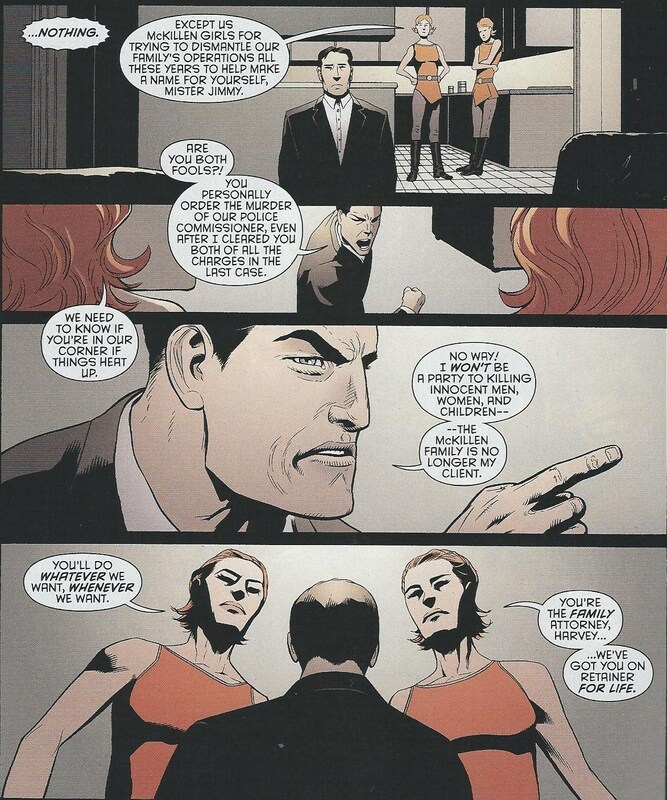 Two-Face is an angry guy throughout most comics. He is the guy that always rides the edge of straight-up loosing it and is second only to the Joker as someone you have to tip toe around when dealing with. This arc by Tomasi is making ME angry and totally justifies Harvey Dent’s anger in my eyes. Erin McKillen has so much innocent blood on her hands and so cavalierly is willing to murder children and innocent women like Gilda Dent and Commissioner Gordon’s wife that I DO NOT think this series would be any better if she survives the arc. If Peter Tomasi’s goal was to elicit solidarity and sympathy with Two-Face he has at least one definite success in myself. Batwoman #27 is a series in major transition. A lot of the controversy comes from the authoritative stance DC editorial has exerted on the writing of their properties, which caused a huge rift with original Batwoman writers J.H. Williams III and W. Haden Blackman, forcing the duo to leave the title. Marc Andreyko was brought on board following their departure and the rationale behind this, for those with a conspiratorial mind, is probably twofold. I personally have never been impressed by his writing at all. His Manhunter series was okay, but nothing to write home about. His recent reintroduction of the short lived Stalker series from the 1970’s was criminally awful. He’s got a lot to prove. So far he’s written three issues of the series. The jury remains out. His “Zero Year” tie-in with the #25 issue was decent and confirmed what we already knew about Kate Kane’s desire to do good, but wasn’t very engaging or innovative. It also preempted the resolution to the cliffhanger ending of Williams and Blackman’s final issue, which is frustrating to Batwoman‘s readers in and of itself. Last issue Andreyko began a completely new arc with a villain called the Wolfspider, a brown costumed Spider-Man ripoff with a penchant for art thievery. The dialogue and interaction between characters was flatter than day old beer and didn’t draw me in at all. The action sequences were well-conceived, but perhaps only came off as such because of artist Jeremy Haun. This issue I will say was much more engaging to read and felt like an issue of the previous run. However, this is largely due to the fact that its story is predicated on Batwoman being drugged by Wolfspider and tripping for a large portion of the actual plot. With that said, all Andreyko had to do was create a collage of traumatic moments from Kate’s past and fill in some word bubbles that due to the nightmarish nature of the dream don’t have to be particularly well written. The brunt of those sequences were visual and THANKFULLY drawn by one of DC’s top tier artists: Francis Manapul. Manapul’s art and co-writing are responsible for the incredible Flash series and in Batwoman his art makes the issue flow in much the same way J.H. 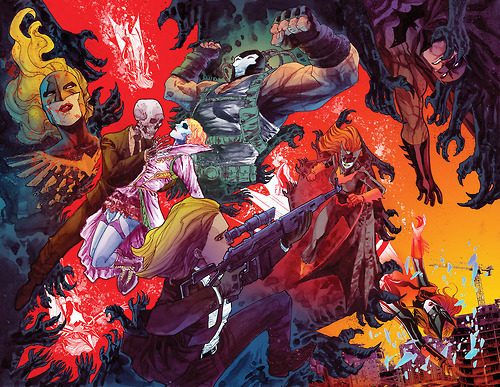 Williams III’s art did in the initial issues of the series. Upon awakening from her nightmare in the apartment of her fiancee, Det. Maggie Sawyer, she is greeted by a startling surprise. The final panel sets the stage for an interesting 28th issue. The lingering question outside of the plot is whether Andreyko is up to the task of writing the continuation? Were he taking over any other title from any other writer(s) then his capabilities as a writer wouldn’t be under as much scrutiny. But to his great misfortune he’s taking over Batwoman from two incredible creators and he may have flown too close to the sun. Green Lantern: The New Guardians #27 reunites White Lantern Kyle Rayner with his former foe, Exeter, but this time as allies. Exeter’s role as the “Watcher” was two-fold, standing watch over the “Anomoly” at the edge of the Universe and safeguarding his home star system. With the defeat of Relic who emerged from the Anomoly, Exeter’s only task now is maintaining peace in his home sector. However, in his absence Exeter’s people have turned genocidal against their peaceful fungal neighbors. The rationale behind their unwarranted attacks and the culprit behind the elaborate ruse that precipitated them makes for an interesting plot situationally and philosophically. Following “Lights Out” and the complete paradigm shift of the books I was beginning to grow tired of the Green Lantern group of books, which truly is a sad commentary considering how insanely I followed them for years. I even contemplated dropping this particular series. However, what this issue of New Guardians as well as others through the Lantern books have done is reestablish the universal scope of the Green Lantern line. Back in the 70’s, 80’s, and 90’s that was what the Green Lantern books were all about. With the return of the Green Lantern title in 2005 under Geoff Johns the scope became refined to simply the different colored Lantern Corps. Perhaps one of the best runs in comic history, but a concept that eventually ran its course. The re-institution of a wide panoply of allies and adversaries by Robert Venditti, Van Jensen, and Justin Jordan is a promising return to some of the greatness of the earlier series done by Len Wein and Steve Englehart. The artwork in this issue was also encouraging, because while regular series artist Brad Walker is a talented penciller, #27’s artist and chronic New Guardians relief artist Andrei Bressan provides gorgeous work that hits on several levels for me personally. I have reconsidered my hastiness in dropping these books and I would urge those that have dropped them or thought about it to also reconsider leaving the Corps. Red Hood and the Outlaws #27 is an issue that has been in the making since the beginning of the series two and a half years ago. 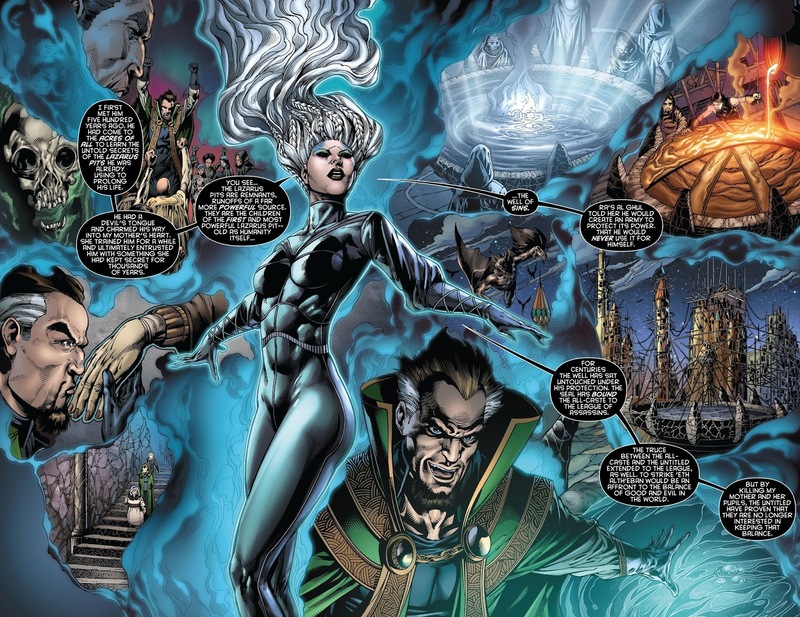 Original writer Scott Lobdell began Jason’s odyssey by having Talia al-Ghul arrange for him to be trained by Ducra, head of the All-Caste, to battle the Untitled. The All-Caste represents the forces of light and the Untitled the forces of darkness. Sadly, Lobdell who made this one of the best DC series right out of the starting gate left the title months before this issue, leaving it to emerging talent James Tynion IV. Tynion is a decent writer and whether or not the course of the title had been plotted by Lobdell prior to his departure or whether Tynion spun his own path to resolving the All-Caste/Untitled war is not known. However, the conclusion to these plotpoints was expertly drafted by Tynion and rendered spectacularly by artist Julius Gopez. The series as a whole has worked so well owing to its predication on the complexity of the character of Jason Todd, former Robin and one of the most controversial DC characters. Stripped of his petulant youth and brought back from the dead, Jason has become a very mysterious, haunted individual that gives Batman a run for his money. To defeat the Untitled and survive requires the purest of souls, making him an unlikely but not impossible choice for the task. Whether Lobdell planned out the past several issues that Tynion has written or whether Tynion rocked it out on his own, his run on the series concludes with next month’s 28th issue. Following that Red Hood and the Outlaws yet again enters uncharted territory under the helm of Will Pfeifer and artist Rafa Sandaval. Even if it tanks, the first 30 issues have been outstanding. Wonder Woman #27 is a book that I find myself torn over. Brian Azzarello is a fantastic writer. Cliff Chiang, who drew this issue, as well as Dave Akins and Goran Sudzuka are top notch talents. The plot is interesting and it is innovative. And yet I find myself laboring to reconcile its rendition of the Might Amazon with those that came before it and the legacy of what Wonder Woman should embody. It makes her the daughter of Zeus, thrusting her further into the world of ancient Greek mythology, but at the cost of her connection and immersion in the DCU. It give license for her awesome power, but cuts off her mortality and the struggle to achieve her strength and prowess that could empower her readership. *Ahem* —That same fact is why Batman will ALWAYS be superior to Superman– *Ahem* Not to mention Azzarello’s questionable choice of turning the Amazons into craven, infanticidal rapists. And anyone who messes with Jack Kirby gains a large helping of Algerian ire. His version of classic Kirby character Orion is downright awful, not to mention High Father and the New Gods. Hang your head in shame, Mr. Azzarello. Ya done bad. In this issue very little is accomplished by Azzarello, but to be fair a decent amount is set up. Wonder Woman turns a former foe into an ally by picking a fight with Artemis, a fight she throws to butter up her half-sister, the Moon. Dio takes Zola to the south of France and turns a bunch of horny teenagers into pigs. And Cassandra seeks out a weak god to open the gates of Olympus for her. In that last development, Azzarello continues to show how strange his interpretation of Greek myth is by having Cassandra lead out on a leash her Minotaur who is basically a dude in a ox-masked gimp costume. Always classy, Azzarello. Perhaps the saving grace of this issue, falls once again on something I appreciated last week in my return to Superman/Wonder Woman #2. 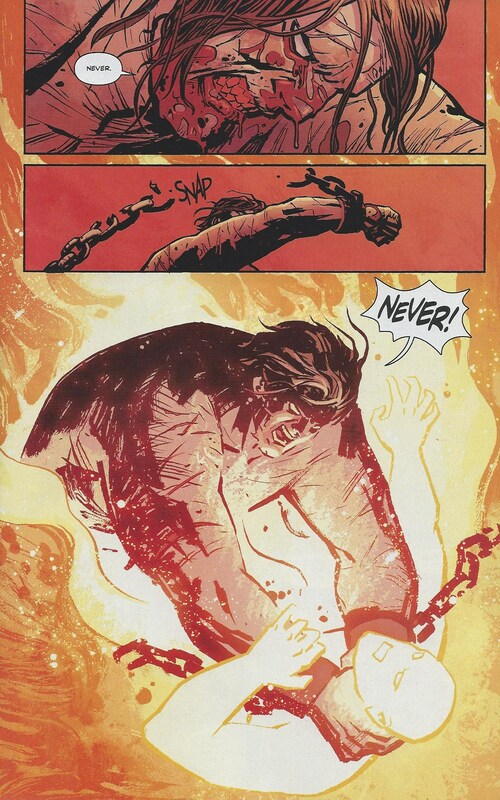 In Wonder Woman Apollo has been mercilessly torturing his eldest brother, the First Born, in order to break him and stop him from seeking that which he always sought: the thrown of Olympus. Though the First Born has always sought it, even when Zeus was sitting upon it, Apollo sees it as his right and would do horrific things to his brother to keep it. All fine and good. But the braggart took too much pleasure in it and “pride cometh before the fall,” as the saying goes. The First Born breaks out of his bonds and looks to beat the tar out of his baby brother. Good on ya, my friend! So pompous and overconfident is Azzarello’s Apollo that he can never get the crap kicked out of him enough times to still that wagging tongue of his. The First Born is not like Superman who has restraint. This time I think Apollo may have stepped in it, but good. If Azzarello lingers on what the First Born does to Apollo and puts the Sun where he won’t shine (figuratively and metaphorically) I will sway my opinion of this series in a more favorable light. Until then I pray this run reaches its conclusion and Wonder Woman trades hands to a more traditionalist writer. The Unwritten: Apocalypse #1 is the beginning of the end for the Unwritten series, but also a really conversational, well paced reintroduction to what the series is essentially about. When last we saw Tom Taylor he was magically drawn into the world of Fable by the strongest magi of that world to defeat the megalomaniacal boogeyman, Mr. Dark. All attempts to stop him, even by Tom and his youthful, allegorical iteration, Tommy, are thwarted by Dark leaving Tom with one last ditch option: blow the trumpet that made all things to unmake everything. System reboot. Start over from scratch. 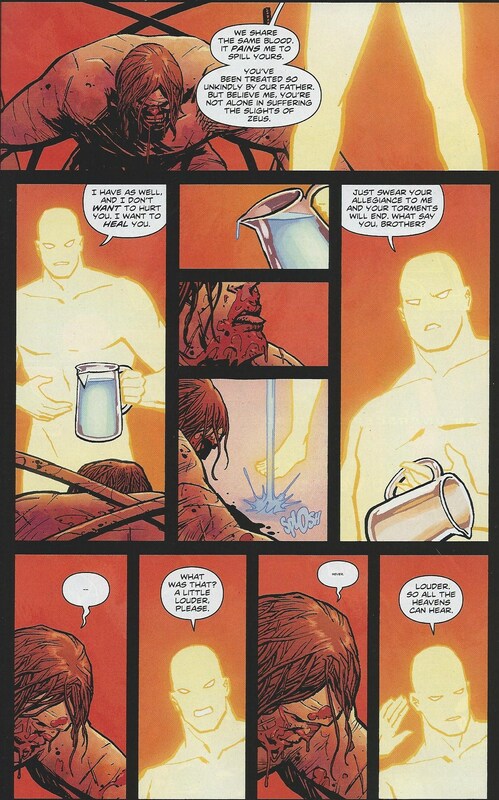 Normally that kind of “if I can’t win, no one can” tactic is used by the more villainous irk, so the utilization of it by Tom was an interesting choice by series creators Mike Carey and Peter Gross, leaving the realm of possibilities wide open for their next arc. Right off the bat Carey and Gross show the importance of words and their perception vs their reality. As ever the course of the story is steeped in literary allusion and the scientific “mythology” of evolution, which serves as an allegory for the evolution of stories from simple concepts to increasingly complex plots. It’s always a safe bet that Mike Carey and Peter Gross will entertain, educate, and enchant with their collaborations. As the title denotes, this is the duo’s swansong on this series. The Unwritten is in its “end of times” and the stories we see from here on out will determine the fate of Tom, his companions, and every incredible Carey/Gross creation since its first issue almost five years ago. Superman/Wonder Woman #3 remains one of the best DC comics being published and only on its third issue. After the conflict with her family, Superman and Wonder Woman part ways again on awkward terms. Supes feeling awkward about his loss of control after being overloaded with power from Apollo’s ill-conceived assault on him with concentrated sunbeams and Wonder Woman struggling to understand Christmas and what to get Superman considering his love of the holiday. These concerns are put aside with the advent of General Zod to Earth from the Phantom Zone. Zod tears it up and is initially met by the (at that time unannounced) Justice League of America headed by Steve Trevor. When Superman and Wonder Woman arrive there is a great amount of tension considering that Trevor is Diana’s ex, but more so because Superman demands custody of Zod considering his status as a Kryptonian. Though they aren’t nations, this is very much like an international standoff of Cold War proportions. The JLA was formed to counter the unchecked might of the Justice League and Superman taking charge of an even more volatile member of his race could be construed by a weary mind as the beginnings of an invasion. However, Steve Trevor is equally verse in politics as he is in modern warfare, so he lets it go for the time being. The issue ends with Wonder Woman unveiling her gift for the Man of Steel which is incredibly thoughtful and something that money could never buy. Yet again, writer Charles Soule has a bombshell to drop by issue’s end. Overall, this third installment of Superman/Wonder Woman is nothing short of enthralling, providing entertaining plots as well as intimate insight into what it’s like to be Superman and Wonder Woman. The lattermost point is more true in this title than Wonder Woman’s own book by Brian Azzarello in which the Amazing Amazon is just an incidental character in a bizarre modern retelling of Greek mythology. If you are a Wonder Woman fan Superman/Wonder Woman is the title you want to get. However, Charles Soule doesn’t stop there. He also mines the character of those around the Super-Couple as well. In this issue Batman talks Superman down from the Moon (literally) when the latter is hiding because of his power overload. 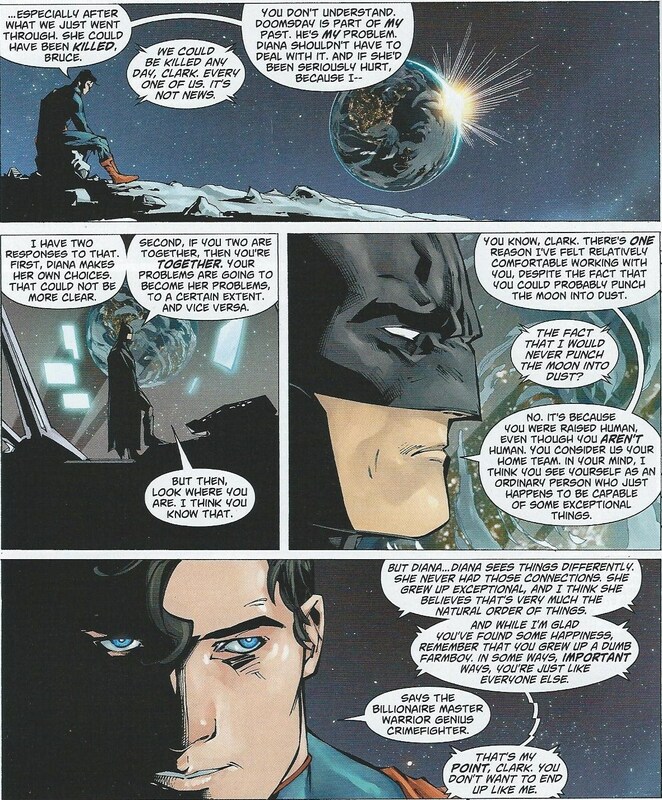 Through the discourse Batman gives a lot of information about the intrinsic natures of both Superman and Wonder Woman, the dangers of each, the world’s possible perception of their relationship, and his own impressions of his teammates. He tells us all this about them, but in doing so Batman also tells us a lot about himself. There is not enough that can be said about how incredible this series is. From a writer’s perspective Charles Soule has the concept of the title orchestrated like a symphony. In the realm of art Tony Daniel is producing some of his best work to date. This is a comic for anyone who likes DC characters, but may not like DC Comics at the present time. Disclaimer: I do not own the rights to any of these images and give credit to those whose work they are. Batman #27: Drawn by Greg Capullo, Colored FCO Plascencia, Inked by Danny Miki. Batman & Two-Face #27: Drawn by Patrick Gleason, Colored John Kalisz, Inked by Mick Gray. Batwoman #27: Art & Colored by Francis Manapul. Red Hood and the Outlaws #27: Drawn by Julius Gopez & Noel Rodriguez, Colored Nei Ruffino, Inked by Sandu Florea, Walden Wong & Dan Green. Wonder Woman #27: Art by Cliff Chiang, Colored by Matthew Wilson. Superman/Wonder Woman #3: Drawn by Tony Daniel, Colored Tomeu Morey, Inked by Batt. This entry was posted in Weekly Reviews and tagged Andrei Bressan, At, Batman, Batman & Robin, Batwoman, Brian Azzarello, Cliff Chiang, Francis Manapul, Green Lantern: New Guardians, greg capullo, James Tynion IV, Jeremy Haun, Julius Gopez, Justin Jordan, Marc Andreyko, Mike Carey, Patrick Gleason, Peter Gross, Peter Tomasi, Red Hood and the Outlaws, Scott Snyder, The Unwritten, The Unwritten: Apocalypse, Wonder Woman.